Hide deals from seller "Clark's Car Care"
Click ‘Get It’ and select Oil Change option or Air Conditioning Test option. Limit 1 per person; may purchase 2 additional as gifts. Not valid for diesel, hybrid or European vehicles. Standard oil included; additional $5 fee per quart for synthetic oil. Air conditioning option includes Freon recharging. By appointment only. Promotional value expires 365 days after purchase. $14 for a standard full-service oil change ($30 value). $50 for an air conditioning performance test ($130 value). Clark’s Car Care is a family-owned auto shop that has been serving the Naperville area for more than 10 years. Laura and Matt, owners of Clark’s Car Care, strive to provide each client with reliable and convenient services. Relieve your stress with the free popcorn and massage chair in the waiting room while Clark's ASE-certified technicians deliver high-quality results. Each person who walks through their doors is treated like a member of the family. Get ready to roll with this deal. 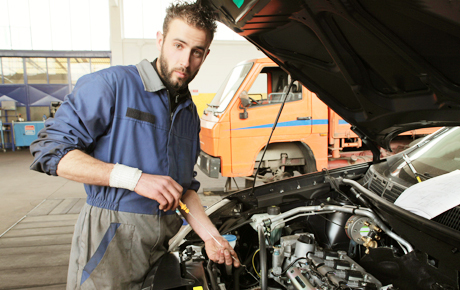 Full-service auto shop in Naperville offering a variety of repair and maintenance services.